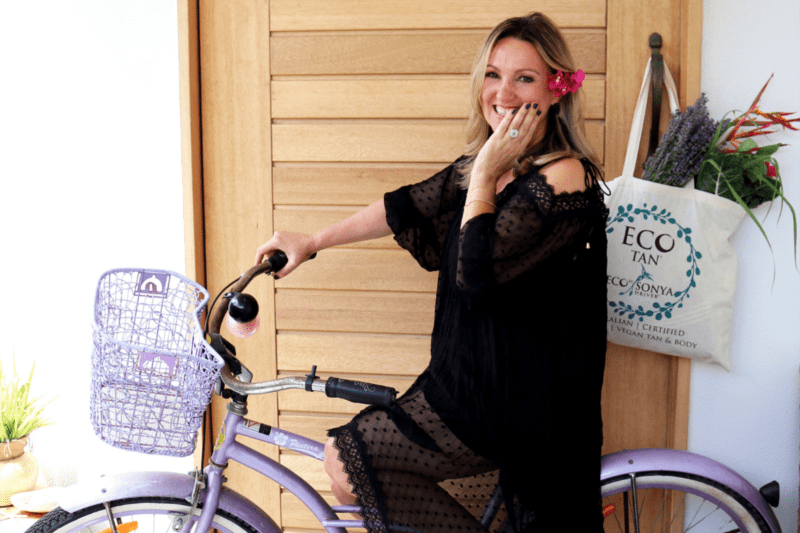 In this week’s episode of The Whole Circle Podcast we talk to the Founder of Eco Tan, Sonya Driver. Who is Sonya Driver and how did Eco Tan begin? Sonya was determined to support her sister, who had a cancerous growth cut from her arm, leaving a horrible scar. Sonya started buying in samples of cacao, flower essence, chamomile and all things natural and organic and started mixing batches out of her tiny kitchen in her Currumbin house. Since Day 1, Sonya has been committed to creating a healthier, animal-friendly and environmentally friendly eco range. Eco Tan is a company that is founded on authenticity and transparency, which is why our certifications are SO important. Sonya makes it sound easy, just order in some samples, start mixing and voila…natural fake tan is born. It certainly wasn’t as easy as it sounds. It was incredibly labour intensive. A vast number of batches went down the drain because they just weren’t right. But just like everything in life, you have to persist, and that persistence has well and truly paid off. Basically, anything synthetic. Along the way she has been asked to compromise on the quality of her products, for example, to make a product 96% natural and 4% synthetic. However, she will never do this. It’s 100% natural or it won’t get made. She will also never put fragrance in her products. This is one of her massive no-go zones. It was important to go the extra mile and use ingredients that are certified organic. Under the Australian National Standard for Organic and Bio-Dynamic Produce you are not allowed to have genetically modified ingredients or animal derivatives or synthetics. It is important to note that the Australian standard is of the highest quality. Sonya sees some Australian brands that actually have European organic certification. Now there are some European certifications that allows up to 5% synthetic ingredients in products. It is incredibly tricky, and the regular consumer is not going to know this information. Sonya wanted to ensure she created her products to be of the highest quality and adhering to the highest standard and certification possible. THIS RIGHT HERE ↑↑↑ is why we stock the Eco Tan and Eco By Sonya Driver ranges because we know we can wholeheartedly trust not only every current product in the range but every future product that will be released because of the integrity and ethos that Sonya holds in her brand. Jo loved this book. It is a really easy read. For those of you who tend to listen to their books rather than read them because you may not have the time, then don’t stress about having to read this book instead of listening to it because you will fly through it. This book is great for those who are wanting to start up their own business and want the motivation to do so as well as great hints and tips along the way. It’s a book to empower you and build you up with the confidence you need to succeed. Head on over to here to get yourself a copy of her book. Originally Sonya’s brand was known for her amazing all-natural Eco Tan range that is incredibly popular. Then she added skincare to her range and wow! We are so glad she did. Honestly, we couldn’t love this skincare system anymore if we tried. We have trialled so many sskin caresystems over the years and never have we come across a system not only as ingredient safe as this, but that actually transforms your skin with amazing results. To check out all the amazing products in the Eco Tan and Eco by Sonya Driver ranges head on over to >>> here.